Well I'm goin' out west where I belong. That's the first line in what would be the highest-charting and most-recognizable hit from one of the many one-hit-wonders of the 1960s, The Rivieras. They were just teenagers in January of 1964 when their hit song "California Sun" made a splash on the charts, and maybe that's why their music is filled with a restless aggression not found in many of their contemporaries. It's even more surprising to learn that the band hailed from Indiana, a place not exactly synonymous with rebellion. Looking back on their small body of work, The Rivieras were clearly a garage band and made no apologies for being so. They weren't chasing ballads about angst-ridden love; they were having a good time and leaving a mess in their wake. Along with some of their peers (like The Trashmen), these guys were HUGE inspirations for what would become the punk movement over a decade later. The Ramones paid tribute in 1977 by covering The Rivieras' biggest hit. It's not hard to understand what they saw in these teens: with raw guitars, fast drums, manic organ, and spitting lyrics, The Rivieras were punk rock before punk rock had a name. They're often classified as surf rock, which is fair, especially since their big hit is about heading to the coast and enjoying the California way of life. However, their other songs don't really have anything in common with the surf movement. Unfortunately, we don't have a ton of music by which to remember The Rivieras. They recorded two full LPs and released a handful of 45s throughout 1964, and while most of it is decent, none of it carries the same power and memorability of their biggest hit. They do a fun cover of Wanda Jackson's "Let's Have a Party," and they even managed to turn out a crankin' version of "Danny Boy," of all things, but their garage roots, their young age, and the fact that a lot of their songs were covers ultimately held them back. Another thing that held them back was the British Invasion. When The Beatles touched down on US soil in February (a month after The Rivieras released "California Sun"), it was all over for anyone that wasn't Brit-pop. The teenagers of America collectively let out a mop-top "Woooooo" and the days of bands like The Riveras were numbered. Throughout 1964 and into 1965, the boys from the band toured local colleges and played parties, brushed up against major headlining acts like Chuck Berry and Jan and Dean, but their education and responsibilities took priority; one band member was failed from high school right before graduation and had to attend summer school to get his diploma. Another ended up being drafted into the Navy Reserve. By the middle of 1965, the band had broken up and everyone went their separate ways. Thanks to Norton Records, we can enjoy The Rivieras in the digital age. 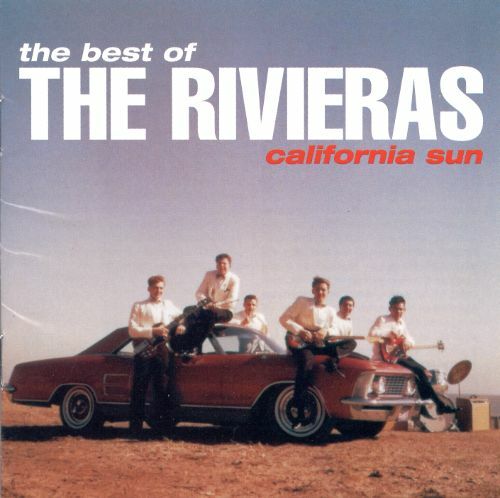 Their pressed CD of The Best of the Rivieras: California Sun is most easily (and cheaply) found directly from their website and not on sites like Amazon where it costs about triple the retail price. Music fans who pick up the disc will be pleased to own 24 tracks from the band that cover pretty much everything they professionally released. Norton's disc is a fantastic production; the music sounds clear and well-mastered, and the 12-page accompanying booklet features 8 pages of notes about the band. Norton Records also sells several vinyl releases for the band, as well as a companion disc that features 22 unreleased songs. It's overkill for all but the most dedicated fans, but it's good to see that the record label has embraced their deal and are putting this stuff out instead of sitting on it. Ultimately, The Rivieras are little more than a footnote in the history of rock music, but their importance and influence on other bands is undeniable. Occasionally, a song comes along that ends up being timeless and outlives us all; The Rivieras created just that with their anthem about seeking the sun, still as fun today as it was over fifty years ago.